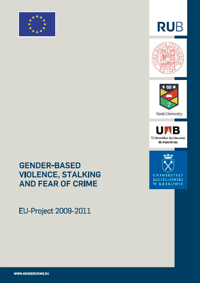 Due to their age and lifestyle, female students as a group are especially at risk from various forms of sexual violence – the aim of the three-year European-wide research project “Gender-based Violence, Stalking and Fear of Crime” (2009-2011) is to verify this hypothesis and to collect, analyse and compare relevant data in five European countries. By analysing the qualitative and quantitative data in a comparative survey it aims to rising awareness for the victimisation of female students. In the consequence this will support universities in their efforts to decrease sexual violence at universities, to help victims and to implement adequate instruments of prevention and intervention. The EU project, which has been funded through the programme “Prevention of and Fight Against Crime” initiated by the EU Commission on General Justice, Freedom And Security, is being coordinated at the Department of Criminology at Ruhr University Bochum in Germany. Besides the German university the consortium covers the University of Bologna, Jagiellonian University in Cracow/Poland, Universitát Autonoma de Barcelona/Spain and Keele University/U.K..